That's the question every client asks – I know it's the question I ask when I'm a client! That's true. We do. The honest answer is still the annoying one though – it depends. Let me explain why it depends and then I'll share actual costs for a copier. Learn more about the costs associated with office copiers by visiting our resource page. All multifunction printers and copiers range in price. Most Black and White printers and copiers cost around $300.00. For more advanced multifunction printers, prices vary between $2,000.00-$20,000.00+. To begin with, we should add printers into this conversation, to better answer this question. Since copiers are based on printer technology and if you use a computer, you probably have a printer too. It’s a device that you’re probably a lot more familiar with. Not to complicate this matter even more, but let’s answer, the bigger question, “How much does a copier, MFP (multi-function printer), or printer cost? Ok? Have you ever bought a car? I'm sure you've bought a car, truck, or SUV at some point in your life, right? First off, what are you going to use the vehicle for? Are you a soccer mom transporting hordes of children to and from practices and games? You probably want to look at larger SUVs or minivans. Are you looking for a car for a 45-minute commute to work? You want a modicum of comfort, good gas mileage, and probably a decent sound system. Are you looking for a driving experience? You want something sporty that hugs the road and can move. You wouldn't expect one vehicle to meet all those needs. Each of these vehicles will have a different price as well. Then there's the choosing between sunroof, leather seats, color, and so on. 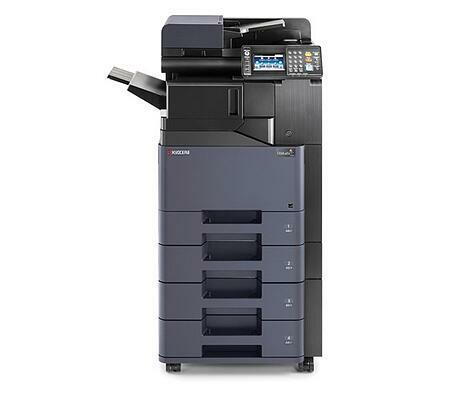 Copiers and laser printers also come in different models and sizes and from different manufacturers. Some are suited for high-volume needs. Others are perfect for occasional print and copy requirements. Do you need to staple? Print envelopes? Add covers? Print and copy to multiple types of paper stock? Bind print jobs into books or fold them into pamphlets? What about security? Do you need to add a card or even biometric reader? Copiers and printers meet different business needs. Like the last car you bought, there are options at various price points. With all of that in mind, here's a breakdown of what you can expect a range of color and black and white copiers to cost. When you see “MFP”, think “copier.” PPM (pages per minute) is the fastest print speed for each device. IPM (images per minute) is the fastest scanning speed for each device. If you need one small device to copy, scan, print, and fax; there are a variety of options at a reasonable price point. A good choice for low-volume use. Again, a small device for individual or small workgroup use. Color speeds approach 32 ppm. Wireless printing capabilities are also often available at this price range. These are the copiers that you find in 90% of all businesses. The workhorse of the business world. They carry the largest load of copy and print volume. And also the conduit between the scanning of documents and your line of business applications. As you need more functionality, speed, and quality of output (as well as ability to handle more types of paper media); prices also rise (no surprise there). Depending on your office environment and volume needs; the lowest volume and cost device could be a perfect fit or you could need to mix and match devices and locations within your office to meet your business’s needs. Applications Integration – MFPs / Copiers can integrate with many business applications to help you streamline workflow, document management, provide cost control, security, etc. Check with the manufacturer to see how you can put these applications to the task. Paper trays – additional paper trays expand input options and can double standard paper capacity, allowing longer uninterrupted operation. Finishing options – Do you need to staple? Make booklets? Create tri-folded materials? Options vary by copier and manufacturer. Data security – copier hard drives can be a source of insecurity because documents are stored in the copier's hard drive. Data security kits allow those documents to be digitally shredded utilizing 256-bit encryption. Output trays – larger output trays allow you to walk away while large print jobs are running. These and other options help you configure your equipment to meet your exact needs. Total impressions volume – how much do you print? Level of scanning – do you need to scan documents? What is the expected volume of documents? Will scanning be ad hoc or bulk? Line-of-business applications – do you need to scan-to-email or other frequently-used business software? Integration of existing infrastructure – will your equipment fit seamlessly (or with minimal disruption) with your current print equipment? How easy is the ongoing management of the printing drivers with your IT infrastructure? Configurations (i.e., finisher, paper capacity, fax) – what add-ons do you need? Then there are issues of support and maintenance. Can your in-house IT staff troubleshoot copiers or will that waste more of their time than they have? Do you need a regular maintenance contract or do you want to pay for maintenance as you go? Do you want to buy or lease your equipment? Is a managed document services partner (someone helps you with placement, selection, user training, and then maintains and services your equipment for the life of the contract) your best alternative? It's never as simple as just buying a copier. Like any technology, your copiers and printers are business tools – what do you want to accomplish with them? Once you know the answer to that question, you can start looking for the right copier for you. If you're ready to purchase (or lease) a copier, get in touch with us today . Here at AIS, we've been helping businesses in Las Vegas, Palm Desert, Orange County, Riverside County and San Diego, to find the perfect copier solutions. If you live in Las Vegas or the Southern California areas, and would like to know more about AIS’s services, you can click here to schedule a consultation or visit our copiers and printers page to review the products and services we offer our customers. Want to read a little more about the real value that copiers and printers bring to your business? Click on the image below to download our free eBook.